Inspired by TRD’s long history of competing – and winning – grueling off-road endurance races in Baja, California and around the world, the Tacoma TRD Pro is built off the 2017 Tacoma 4x4 with a five-person double cab and a five-foot cargo bed. To this, TRD engineers have added capability and style for a unique, incredible off-roading experience. Performance upgrades include the TRD Remote Reservoir Suspension Kit, TRD-tuned front coil springs with Fox Racing Shocks (with a one-inch lift and progressive-rate rear leaf springs), a TRD Pro quarter-inch aluminum skid plate, and P265/70R16 Goodyear Wrangler All-Terrain Kevlar-reinforced tires and TRD-tuned stainless steel exhaust. Distinctive performance calls for distinctive style, and inside and out, the Tacoma TRD Pro is immediately recognizable as something special. This pick-up is offered in three striking colours; Super White, Barcelona Metallic Red and a model-exclusive, Cement Grey. It’s then further set apart with exclusive 16” black alloy wheels, TRD Pro badge on the front doors, black TRD Pro and 4x4 rear tailgate badging, a hood scoop with matte black decal, a heritage “TOYOTA” front grille, Rigid Industries LED fog lights, colour-keyed mirrors, door handles and rear bumper, and black bezel headlamps and tail lamps. The Tacoma TRD Pro’s unique styling is carried inside with black TRD Pro leather seats, a TRD shift knob and TRD carpet floor mats. Under the hood, the Tacoma TRD Pro is powered by a robust yet efficient 3.5L V6 Atkinson cycle engine that delivers 278 peak horsepower and up to 265 lb-ft of torque. This engine is fitted to a choice of six-speed automatic transmission or six-speed manual gearbox, and on-demand 4WD with a transfer case and automatic limited slip differential and Active Traction Control. With a 2,900 kg (6,400 lb) towing capacity, every Tacoma TRD Pro is standard-equipped with a towing package that includes a Class-IV towing receiver hitch, engine oil cooler, 7-pin and 4-pin trailer wiring harness, trailer sway control, and more. The five-foot composite-lined cargo bed features an integrated 400w/120v power outlet, cargo bed cleats and tie-downs, and Toyota’s easy lift and lower, locking and removable tailgate. Payload ratings are 430 kg (950 lb) for manual-equipped models, and 450 kg (1,000 lb) for automatics. Off-roading adventure is at the driver’s command. Analogue instrumentation is enhanced with a 4.2” colour multi-information display with integrated inclinometer and tilt gauge, a leather-trimmed steering wheel fitted with audio and Bluetooth controls, Blind Spot Monitor with Rear Cross Traffic Alert safety technologies, and, on models equipped with the automatic transmission, smart key system with push button start. All Tacoma TRD Pro models come with a locking rear differential. Models equipped with the manual transmission features Hill Start Assist Control, while automatic transmission models have Hill Start Assist Control, plus Crawl Control and Multi-Terrain Select. And because the Tacoma line-up is the first in the industry to be standard equipped with a dash mount for a GoPro camera, Tacoma TRD Pro drivers can easily record and share their adventures. The two Toyota Tacoma TRD Pro models join the existing Tacoma line-up for 2017. 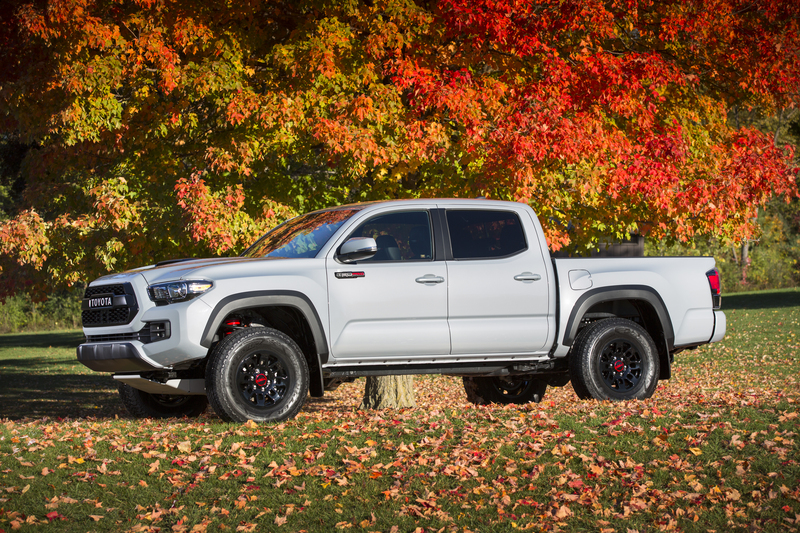 For complete and up-to-date details and specifications on the TRD Pro and all other Tacoma models, visit www.toyota.ca/tacoma. The 2017 Toyota Tacoma TRD Pro pickups are now on sale at Toyota Dealers across Canada, with starting MSRPs of $50,000 for the manual transmission and $53,295 for the automatic transmission.